This year Earth Day falls on Friday, which means there is a whole weekend of Earth Day festivities around New York City and here at NYBG! The LuEsther T. Mertz Library is inviting you to check out some of our favorite books that will be perfect reads to tie into your Earth Day plans. Young and advanced readers alike will get into the spirit of the holiday with these titles from our Children’s Collection. We hope you visit us and enjoy your Earth Day celebrations! Farms are everywhere! You just have to look! A box, a shoe, a lot… anywhere can be a farm because all you need is sunshine, soil, water, and a seed. 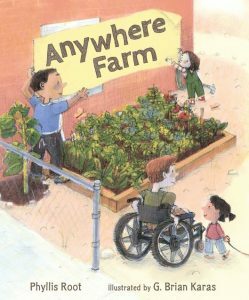 The rhythmic narrative of Anywhere Farm drives home the idea that gardening, farming, and planting can take many forms. Examples of this are easy to find in the colorful illustrations that grace each page. This is the perfect book to offer to new and experienced readers as it simply inspires all to get creative and just plant! 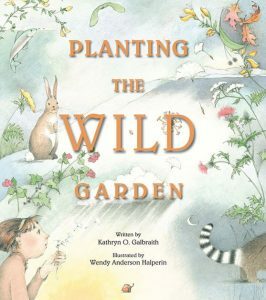 Planting the Wild Garden journeys through the many ways seeds are planted in the wild. Animals, birds, wind, and water are all responsible for the flowers we see around us. Soft colors and detailed illustrations transport readers into the environment allowing the readers to feel the wind, hear the rustling trees and smell the meadow. Snap! Whish! Plop! The narrative reads with vibrant sounds and new vocabulary making this an easy introduction to the subject. Theodora and Poppa have begun a project to recreate Poppa’s old garden on canvas for the balcony of his new apartment. Using paintbrushes and imagination, the two spend each visit recreating the seasons with vibrant colors and scenes they both love. As Poppa gets ready to leave for vacation, Theo is left to tend the garden in his absence. Unsure of her gardening skills, Theo asks Poppa for guidance. He reassure her that the daffodils and tulips should burst onto the scene while he is away and she will know what to do with the rest. As Theo adds the flowers, she begins to add some of her own elements and with her final brush stroke, Theo realizes she has brought the garden to life! 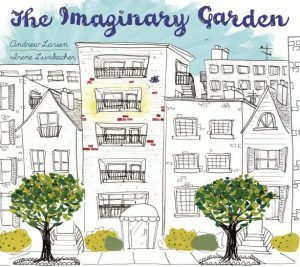 The Imaginary Garden is a heartwarming story accompanied by sketched illustrations that burst with color as Theo and Poppa get further into their very own garden. “Fantastic flowers in all kinds of shapes.” Indeed! 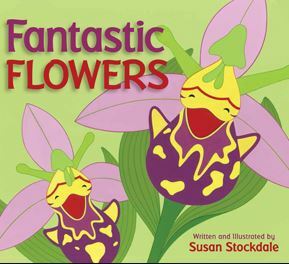 Susan Stockdale invites the youngest of readers to take a closer look at flowers and think about what they look like. With a little imagination, flowers can transform into spoons, bats, and even scoops of ice cream! Stockdale’s illustrations paired with clever rhymes make a perfect book to read aloud. Fantastic Flowers is one of those books readers can grow into. The book ends with a page explaining the flower as a part of a plant and the role of pollinators followed by a series of photographs and descriptions of each of the fantastic flowers featured throughout the book as stylized illustrations.